In an interview Davies told Eastleigh News she thought that under the Lib Dems Eastleigh Borough Council had overextended itself in building a property portfolio and that the council could soon be forced to start selling assets, including council owned land to developers, in order to service its debts. 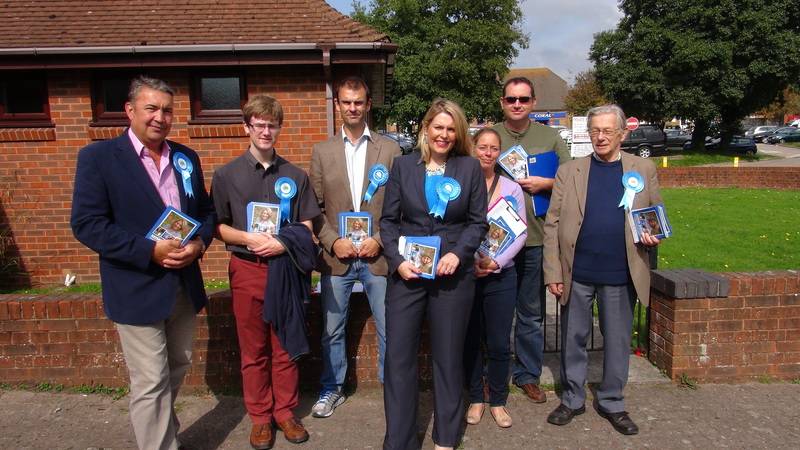 The general election may still be nine months away but Eastleigh Conservatives have been hitting the campaign trail in Hedge End – a key area they must win to regain the seat and a task that Conor Burns and Maria Hutchings both failed in twice. Hutchings’s defeat in the 2013 by-election was largely due to the huge swing to Ukip. Although Hutchings had started out as the bookies favorite the Conservatives ended up in third place for the first time, even though the entire Conservative front bench had descended on the town during the campaign. Davies will have her work cut out convincing Conservative defectors to return to the fold but she believes she can do it. “The by-election was a very toxic time and a different time in politics. She added that the economy wasn’t doing so well in 2013 and believes that the Conservative record on the economy will sway voters. David Cameron, she said, had delivered on the Scottish referendum and could be trusted to deliver the promised EU referendum in 2017. She said disenchanted Conservative supporters who may have switched to Ukip last time over concerns about Europe or immigration would be disappointed if they voted Ukip in the general election as it would result in a Labour government. Mims (short for Miriam) Davies is a mum of two from Sussex. A former BBC journalist she is currently a Mid Sussex District councilor and describes her occupation on her register of interests as “housewife”. Husband Mark is the financial director for a commercial property management company and has also been out campaigning on Hedge End doorsteps. Davies said the family would move to Eastleigh if she won the seat and would immediately resign her council seat. She criticised Mike Thornton for not giving up his seat on the Borough and on Bishopstoke Parish council. Immigration had been a major issue in the by-election but Davies said the government had cut immigration by a third and that people wanted to migrate here because the UK is a prosperous country while British citizens also enjoyed the opportunity to work abroad. One local issue Davies agrees on with her Ukip counterpart is the cost of parking in Eastleigh town centre, which Davies says, is more expensive than Southampton West Quay – she also says it’s unclear where Eastleigh’s parking revenue is going. Of course the level of parking charges or planning decisions are not decided by MPs but Davies has promised to bring “a fresh pair of eyes” to the borough as a “community politician who has made a difference” and said her main priority would be to hold the local Lib Dem administration to account. Indications are that the 2015 will be a just as much of a tight, three-way fight as it was in 2013 with Ukip, the Lib Dems and Conservatives all vying to squeeze their opponents core vote. The 2015 election will inevitably be a tight contest between the Lib Dems and the Conservatives, but this interview does show up front what limited understanding the new Conservative candidate drafted in from Haywards Heath has of the Council and local politics here in Hampshire. Keith House in denial as usual. Still croaking on about the so called two horse race between LibDem an Conservative. He seems to think that everyone is fooled by his constant poppycock! Has he forgotten that UKIP came a close second to LibDems in the 2013 By-Election when their last Eastleigh MP was Jailed? Has he forgotten that UKIP is in second place in almost all Eastleigh Borough wards? No of course he has not forgotten. He is just Lying to himself as well as the people of Eastleigh. There really is only one party that can beat LibDems at the 2015 General Election and that is UKIP. House just wants you to think it is Conservative as he knows a vote for them will help him and his useless MP Thornton! Not in denial at all. Just desparate to either dismiss UKIP at any opportunity, or, even better not mention them at all. The LibDems know that UKIP are their biggest threat and are desparate not to give them any publicity at all. By claiming a 2 horse race, they hope people will completely dismiss UKIP as a party with a chance of winning. The LibDems are very clever, they haven’t had this much power for so long by being stupid. And the people of Eastleigh believe them and keepvoting for them. Bet she has a better idea of the wishes of local people and what they want! Keith House LibDem Leader of the EBC. He knows what we the people want and our wishes. He just couldn’t care less. It is his way or no way. LibDem Councillors do not represent the people, they represent Keith House! First we get rid of Mike Thornton this coming May and then we start to sack his LibDem councillors one by one until he is no longer leader and has to do as he is told by the people or resign. If he doesn’t resign, In 4 years we can sack him too! Could happen sooner than you think. With EBC going bust crippled by mega interest payments for the Age as Bowl Hotel from the source of the mega interest loan??? Keith House is very keen to position the next election as a fight between the LibDems and the Conservatives as he knows UKIP is the only party which can remove the LibDems from power. If you want to keep House and get more houses built in Eastleigh, voting Tory is a good way to go about it. In Eastleigh the skewed nature of the FPTP system works in their favour So long as they can continue to maintain a certain number of core voters and keep the opposition spread amongst a range of other parties they are home and dry. They are masters of PR and securing tactical votes with their infamous bar charts. Interestingly there is no mention of UKIP in the above comment – despite the fact that is was most definitely they, and not the Conservatives, who were the main challengers at the recent by-election, or did I miss something? It’s time for electoral reform so people can vote for what they believe in rather than who they detest the least. yes I agree Stuart. It would change politics and democracy totally if we had PR. Real PR in effect means that everyone (almost) gets to have a voice. And as you say people could then vote for what they really believe rather than who they think may have a chance of getting elected. A fair votinig system that allowed voters the maximum choice of candidates between parties and within parties is the Lib Dem preference both for local government and Westminster. what does that mean , a maximum choice , do you mean everyone in the borough ? between parties ? does that mean independent? is there actually any room between the tories and libdems nationally …..? or locally ? why are eastleigh tax payers paying for your failing property empire , that is the question ? he talks a lot of misleading TOSH! I hear the district Auditor is not impressed with EBC too! Before a Conservative accuses another party of complacency, perhaps they should look to see how many candidates the Tories put up for Hedge End Town Council in 2011. I love the way Keith House and the Lib Dems pretend UKIP doesn’t exist! Seems Eastleigh Lib Dems have been taking propaganda lessons from the likes. For the frightened Lib Dems, the problem is; people are starting to speak out against House and collective of drones! General House is losing his totalitarian grip on power just as he has apparently almost bankrupted our council! Only UKIP can beat the Lib Dems! Even though the Lib Dems deny UKIP exist. -Free parking of at least 3 hours at the Use it or Lose it Swan Centre to help businesses& shoppers alike. Fund it with cuts in LibDem council vanity projects & perks(like, ironically, free parking…). -Get Eastleigh infrastructure like roads, a bypass &sewers & surgeries& schools in place BEFORE building more homes. Why haven’t the Libdems done this? – Stop unlimited EU immigration that makes planning for services & jobs impossible. Let’s welcome needed migrants from the whole world who come to integrate & support our culture- but No to the out of control numbers that EU- loving Libdems advocate. Vote Ukip Get Ukip- let’s refresh Eastleigh next May with Commonsense- it’s my only language. Nice ideas for Eastleigh but haven’t you anything original to say? The Tories on the Council have already been calling for “your” suggestions. Find your own bandwagon or join the Tories. But then there aren’t any Ukippers on the Council. “Bandwaggon”, You are sounding much like @Mike4Eastleigh Hmmm?? Lastly Let us look back at the By-Election result of 2013 when Mike Thornton Won by the skin of his teeth and UKIP Came a very very close 2nd place. Maybe the reason for LibDems sharp drop is due to the Last LibDem MP (Chris Huhne) being Jailed as a common criminal!. Ironically, Mike Thornton and the Ridiculous LibDem focus team are now promoting bar charts from the 2010 General Election result when Huhne was elected. Desperation I would call that! Anyone who wishes to oppose the LibDems MUST vote for UKIP! A vote for Conservative or Labour will just split UKIP’s vote and help the LibDems! Now then, what is the collective noun for an area with UKIP voters? In my head it’s “an infestation”. UKIP.,… FUSE BLOWN. NO CHANCE. EVEN LORD FARAGE WOULD NOT STAND IN EASTLEIGH!!!! NOR DIANE JAMES……BAGGAGE COMES TO MIND!! I don’t recall Boris Johnson being too keen to stand in Eastleigh either…. In 2015, the PPC’s are fighting a General Election. I’m happy to see them campaigning on national issues, such as immigration and the UK’s exit from the EU. The urgent need to build J6 of the M27 is probably an issue that they could usefully campaign on too. UKIP’s sums on parking don’t add up: massive cuts would result, or an end to the 11 year record of real-term cuts in Council Tax, uniquely achieved by Eastleigh Lib Dems. Don’t forget the cuts made already to services and staff EBC have made. With more Job cuts to come as a result of the £4.7Million shortfall! Even Grass cutting is getting less frequent! Re-read my post. Every year for 11 years Eastleigh’s council tax has gone down in real terms. That’s a record unique to Eastleigh and the Lib Dem team. when this is factored in , as it must be to appropriately use ‘real terms’ there is no cut. The facts remain unchanged: Eastleigh has the best record in the country on Council Tax over the last 11 years thanks to the Lib Dems. Government grants don’t meet the long-term difference of these savings, and our policy pre-dates this Government by 7 years. Wessex House in a state of disrepair! Leigh Road Council Offices left to go to the wall! Massive overspend on the new Council Offices with NO PARKING! You are in a never never land Mr House and Eastleigh Lib Dems. Services cut in real terms, officers leaving and NOT being replaced! That is in the real world job cuts! if you had charge of the council what would you do with the debt and the property that EBC has? Surely, if the income for each individual property is servicing its debt and providing a surplus that goes back into Council coffers, it makes sense to keep the property…? On projects where that is not happening and it is questionable whether it will ever happen, such as the Ageas Bowl & the associated Hotel, the Council should be offloading that liability…? problem is the risk , if a normal property company goes bust – investors lose money and there is a fire sale , can the council go bust ? we taxpayers are the security on their loans , and the commercial property market in Eastleigh is propped up by their involvement – it is interest rate apartheid they get .5% we get 3 or 4% at best – cheap money inflates bubbles. How do they get out of it – they can’t move into every unused office block. Also they are the planning authority – it is not right to be a property developer and the LPA at the same time. Patricia, “only Ukip bother to voice what real people are thinking..” Ukip only party to listen and act for the people as the other 3 main parties don’t? Is that why Ukip will not offer those real people a referendum on EU membership? So here we have Ukip saying We know best, WE will decide , We are right on the EU and WE’LL ignore everyone else, the very same thing THEY accuse the other 3 main parties of. There’s a word for that. Ukip may have topped the EU poll but more people combined to vote against them and possibly therefore against an EU exit. To say a vote at whatever election time is a vote for EU exit is pure fantasy and shows Ukip just want to dictate to the real people their views on the EU. Agree with pianoman, nice ideas, jump on bandwagon, nothing new, no policies and certainly no costings to justify above comments that make sense! Sums up Ukip locally really! Better stick to running community pages. Piano Man….. Initials… MP backwards! So that’s two more LD’s who do not know what the voters of Eastleigh want! So Paul, will the LibDems be offering a referendum on the EU? NO.. They need the immigrants from Romania to Staff the Ageas Bowl Hotel. Had you not heard Hilton are recruiting there! Hampshire County Council, Sam! Not our local Borough Council. So your councillors don’t get involved Keith! Do you stop our local councillors from reporting pot-holes! Always very happy for residents and councillors to report pot-holes: let’s improve the safety of our roads! Well, if Diane James is UKIP’s candidate here in the General Election, UKIP will win! The Conservative’s latest candidate certainly hasn’t picked up on the fact that the biggest thing that lost the Lib Dems votes at the last by election (and subsequent local elections) was the wanton destruction of our best countryside by the Lib Dems (and the fact that they were campaigning to get votes – especially in Bursledon – as badly hit as Boorley Green – by saying they were protecting the countryside!). And with the Conservative candidate’s partner in the commercial property business, well, she’s hardly going to be sympathetic to so many Eastleigh residents being against the Council (and Government) being so keen on building on countryside. Diane James isn’t the Ukip candidate here, Patricia Culligan is. I think you need to listen to the interview again and listen.This new woman seems to understand about unwanted greenbelt building very well. Just seen the separate article re UKIP’s new candidate. A mistake it not being Diane James (who could have built on the votes she had before) but it will be interesting to see how this candidate pans out. About time Labour came up with a decent candidate for Eastleigh too! Labour’s candidate is Mark Latham from Hamble. Hope to interview him soon. Chris Huhne did it but he found juggling the two left him pressed for time, I think. I thought that selling publicly owned assets was what the Conservative party were all about?! So am not sure why she should flag this as a fear for Eastliegh? Selling assets is not Lib Dem Council policy. They have taken an opposite position. I have been expressing my concerns at the size and manner in which they’ve justified huge borrowing levels since 2010 ! I understand they have now authorised our Council to future borrow up to £147 million pounds !. . . . This, a Borough level Council , borrowing over 20 times it’s income when compared to it’s annual Council Tax revenue. Like many, I thought we were clearly advised that it’s been over optimistic borrowing that in many ways has contributed to the Nations financial woes. The aim was I thought, Reduce Borrowing. This Council has been sprinting in the opposite direction ! As many a commercial property speculator has gambled, asset value and projected income from rents has justified all. But the gamble is with private money. I’ve no problem with that. They try to judge when to cut and run with a nice profit which often works short term. But, many a Company has dragged early profits out, and then built up debt, only to then so unfortunately be ” forced into administration” . The Council can not play this hard nosed game, nor should we wish it to. The Councils excuse for not having to be “commercially minded” is because, unlike business, it’s role is also to provide community advantages which are non profit motivated. Hence, we have been encouraged to believe that the motive for ‘investing in the Rose Bowl’ is for such reasons. Consequently, funds, grants and publicity for what’s happening there is championed at every opportunity. But, why have so many other ordinary Lib Dem Councillors more or less just done what they’ve seemingly been expected to do, i.e, “to a man”, vote in support of the proposals ? Sorry, not so many, I should say just about every one of ’em ! In my view, our Council suffers because it’s thoughts and decisions are not challenged enough. But when you control the actions of 40 odd Councillors, most of whom you will note Never respond on this forum, or other ones, or reply to newspaper letters, are our ‘Representatives’ really standing up for our opinions and concerns ? You misunderstand John, I suspect on purpose. The Council acquires and disposes of assets as part of a clear business strategy to maximise income and protect services. That includes the Ageas Bowl project. What readers here may not know is that you, a former UKIP candidate, have cost the council over £40,000 extra in audit fees trying to press your case, and failing, with the District Auditor. The strategy has the support of the vast majority of councillors and, indeed, has also been recommended by senior staff. Trying to make the case that this is not the case is, frankly, dishonest. The real cost of UKIP in Eastleigh. Oh dear. Instead of dealing with or responding to the opinions expressed, some just can’t help but go on the personal attack. I believe the body “District Auditor” no longer exists. The Councils appointed Auditors Ernst and Young LLP carry out their legislated functions and independently decide how much time and work they consider necessary. The fees charged are theirs. From the outset, I have held grave doubts in regards to the Councils involvement in the Rose Bowl Hotel, and then latterly the Stadium itself and proposed golf course. These concerns were and are not only held by me. This years Auditors, and previous, have specifically looked into the manner in which the Council has dealt with some of the issues relevant to the Auditors responsibilities. The size and complexity of the work that the Council became immersed in almost compelled them to do so. In some instances it is just as well they did, for they were able to make recommendations that the Council complied with. My dealings with the Auditor were done so on a “member of the public” basis. At no time have I put anything to them on behalf of UKIP or any other organisation. I have never written to the Council on behalf of UKIP. In fact, they’ve played no part at all in any of my dealings over these matters. To some how come to the conclusion that I am being dishonest because I have a differing perspective on events, events that I have endeavoured to follow very closely, probably says more about my accusers than it does me. In my view, it will take many years before this project fully pays it’s way, if indeed it ever does. To me, the figures don’t add up, even with the Council contributing hugely by way of subsidy and other support. I see nothing wrong in letting my opinion be known. Of course you are entitled to your opinion John and to share it. The fact remains that your actions have resulted in over £40,000 of extra costs of auditing over recent years. Meanwhile the Council’s policies have protected residents from cuts and given 11 years of real term cuts in Council Tax. You Mr House. And EBC spent also a great deal of council tax payers monies preventing the disclosure this year of an order to disclose by the Information Commissioner of an FOI or be in contempt of court. You went to the High Court to stop this disclosure at OUR expense. What are you so afraid of the content of this content ordered? John he makes personal attacks on residents at LAC meetings too, when they are against his doctorial line.When the resident has on his instructions…that are wrong and flawed…no right of reply. Do you mean doctrinal or doctorial Eastleigh voter. lam trying to write an expose of EBC’s commercial position is there any help you can offer me Mr House ? I interviewed Paul Ramshaw last week and it’s fascinating to me that he knew nothing of EBC’s borrowing , thats the 3rd senior person at the council who I have had to inform. it is now the the biggest beast ever , it has taken most of our wealth but still grows on the profit of…..
Mr House I don’t know how we fair in comparison to other councils with respect to tax but I bet we are number 1 in debt per capita , it would take a few days ,can you fund my research ? £150 ? Sam-Waiting for your reply Keith. I think what all the political parties fail to understand is that a high proportion of voters do not support – and never have – any of the political parties so voting is done on the basis of what the individual candidate says they will do (or not do) and the personal strength/charisma etc of that candidate. Hence Diane James doing so well, though the Lib Dems’ continual “propaganda” leaflets (and Maria Hutchings not turning up at a late hustings event, plus the Labour candidate being more of a comedian than a serious contender with any knowledge of the area) did have a major impact in driving people to vote for UKIP too. I agree that we need proportional representation. The turnout for voting would be higher if that was the case too, as so many people don’t bother voting because of the current system and the belief that all political parties “are as bad as each other”. As for what Chris Huhne did, I saw his personal error (though morally wrong and illegal) as totally unrelated to his being an MP – especially as I know of local families who have done the same thing! – and would have voted for him again (at least he was an experienced politician and a key player in Government!). Far worse, in my and many other local people’s opinion, was the Lib Dem campaign wording used to mislead local people in order to get Mike Hutchings elected (eg a leaflet distributed to Bursledon residents a few days before the by-election saying “The Council has made a big CUT in the amount of greenfield building needed over the next 20 years and saved EVERY site in and around Bursledon”. – which gave the impression that the Local Plan draft would be changed to omit proposed developments BU1, BU2, Pylands Lane, etc, and which omitted to say “EXCEPT the major developments of hundreds of houses in the draft Local Plan on Bursledon’s best countryside, and for which we will be pushing through our Lib-Dem controlled LAC, and approving, planning applications before the Local Plan is approved”. And no doubt Mike Thornton is keeping his local councillor position until next year because he knows he’s unlikely to be re-elected as MP for Eastleigh! Mike Thornton will not be re standing as a Borough Councillor next May. Will that be in the same way that he said he’d give up his seat on Bishopstoke Parish Council… and is still there? Vince Cable say’s —I’m in favour of closing Golf Courses we need more homes. But the South East is overcrowded and can’t take anymore. Lib -Dems closed Fleming Park Course and what a mess its in now. Lib Dems lied, they told us dog owners needed the land for walking their dogs. Another Lib Dem fib- dog owners had the right of way on a public golf course. I believe its time we told OUR local councillors they must be more transparent and accountable to local people and not their political masters. Lib-Dems have a strong hold in Eastleigh-and only the Tories can keep UKIP out-“Big mistake “UKIP” Diane James would have taken Eastleigh.